As reported here, New York City is considering new rules to limit the number of vendors in public parks. Efforts to control the streets and sidewalks are nothing new in NYC, of course. Vendors seem to have multiplied outside museums and in parks like Union Square Park, perhaps in part as a result of the sour economy. There are serious First Amendment issues lurking in this latest effort to regulate NYC's public spaces. The proposed rules would substantially reduce the number of verndors in some spaces -- perhaps by as much as 75%. At Prawfsblawg, Bill Araiza raises some interesting questions in this post regarding the proposed rules' focus on expressive vendors (versus commercial and other vendors). 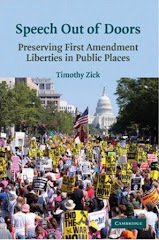 In truth, the First Amendment protects the right of all the people to use our public spaces. The right to sit quietly on a bench is as fully protected as the right to declaim at a speaker’s corner. Sometimes the government may appear to be the opponent of free assembly and free expression, but the new park regulations protect the rights of the majority of park users while standing up for the rights of the individual art vendor. The reason the First Amendment grants an exalted status to public parks and sidewalks is that they have been used time out of mind for public discussion and debate. "The right to sit quietly on a bench," if meant to suggest some right of tranquil use free from disturbing vendors, is not "as fully protected" as a speaker's right to use public forum spaces. I hope officials will keep the preferred position of expressive uses in mind when drafting and approving the new rules. Commerce has already consumed a good portion of what once were expressive public spaces. By all means, require that the benches be shared. But we can ill afford further diminishment of opportunities for pamphleteers and other speech vendors in public forums.